Based on George Engel’s model, The Biopsychosocial Formulation Manual presents ways to help psychiatry residents and students effectively gather and organize patient data to arrive at a complete mental health history in a limited timeframe. While most current models only take one factor into account, Campbell and Rohrbaugh emphasize and analyze three essential components (biological, social, and psychological). The process of identifying pertinent data for each component of the biopsychosocial formulation is explicated in detail. A separate section outlines how to use the biopsychosocial formulation to generate treatment recommendations. This volume includes a complete package for practicing the biopsychosocial method; this easy-to-use guide includes a data record sheet and a companion CD to facilitate organization and assessment, appealing to both the psychiatric professional and the trainee. Introduction. 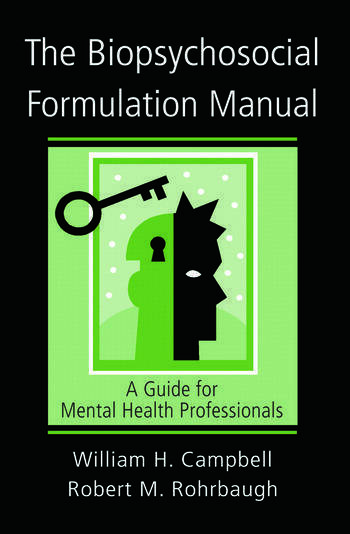 An Overview of the Biopsychosocial Formulation Model. The Biological Formulation. The Psychological Formulation. The Social Formulation. Differential Diagnosis. Risk Assessment. The Biopsychosocial Treatment Plan. Prognosis. Putting it all Together. Appendix A - Other Psychodynamic Perspectives. Appendix B - Major Ego Functions. Appendix C - A Glossary of Psychoanalytic Terms. References. Index. Templates. William H. Campbell, MD, MBA, is Assistant Professor in the Department of Psychiatry at Case Western Reserve University School of Medicine and Medical Director of the Ambulatory Care Division at University Hospitals of Cleveland in Cleveland, Ohio. Robert M. Rohrbaugh, MD is Associate Clinical Professor, Associate Residency Director of Medical Student Clinical Clerkships in the Department of Psychiatry at the Yale University School of Medicine.